While McDonald's is known for its food, there’s one thing that they don’t get credit for; helping younger people start their careers by providing them with skills like: teamwork, responsibility, and customer service that they can take with them wherever their career may lead them. Through our television campaign, we helped to establish McDonald’s position as America’s Best First Job, to help lead into our skills story. We wanted to show Generation Z that the skills you learn on the job at McDonald’s are the same skills that will help you succeed in your career, no matter where you go. 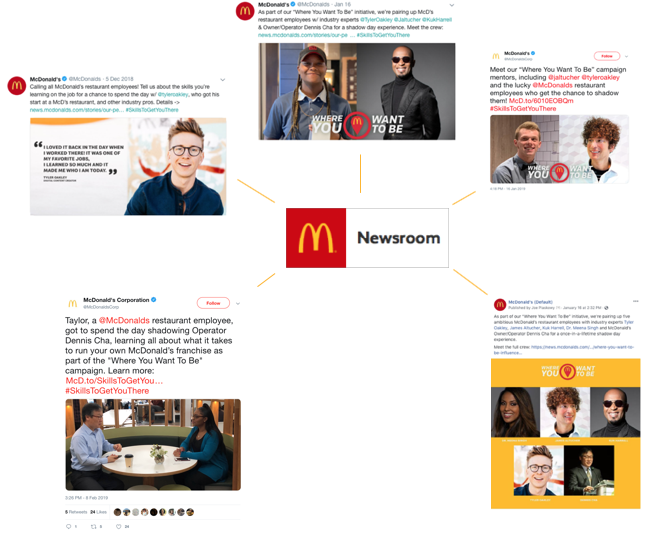 So we created the McDonald’s “Where You Want To Be'“ program that gave McDonald’s restaurant employees to work alongside a professional in their chosen career field. We created content surrounding our employee and our industry leading professional and pushed that out via our social channels as well as theirs. We pushed content out via McDonald’s social media channels as well as leveraged our influencers channels to reach a wider audience including Generation Z.